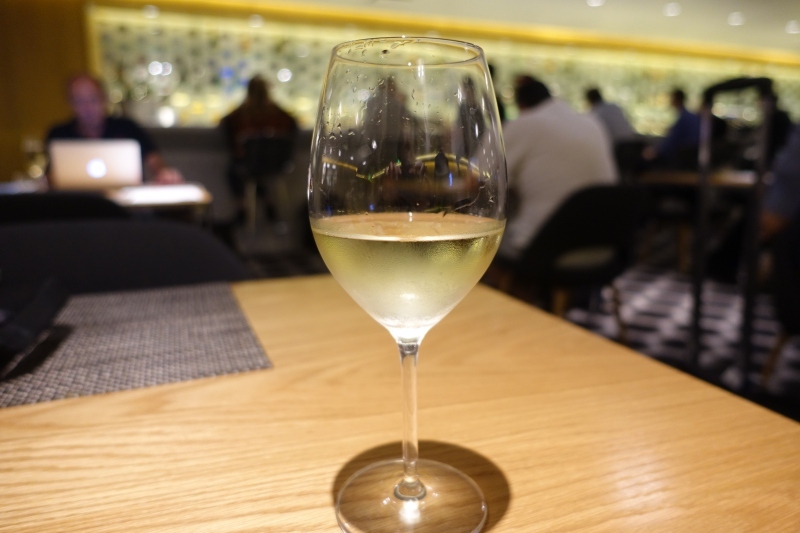 This Review of the Qantas First Class Lounge at Los Angeles LAX's TBIT (Tom Bradley International Terminal) is part of a new trip report including Cathay Pacific First Class and luxury hotel stays in Asia. 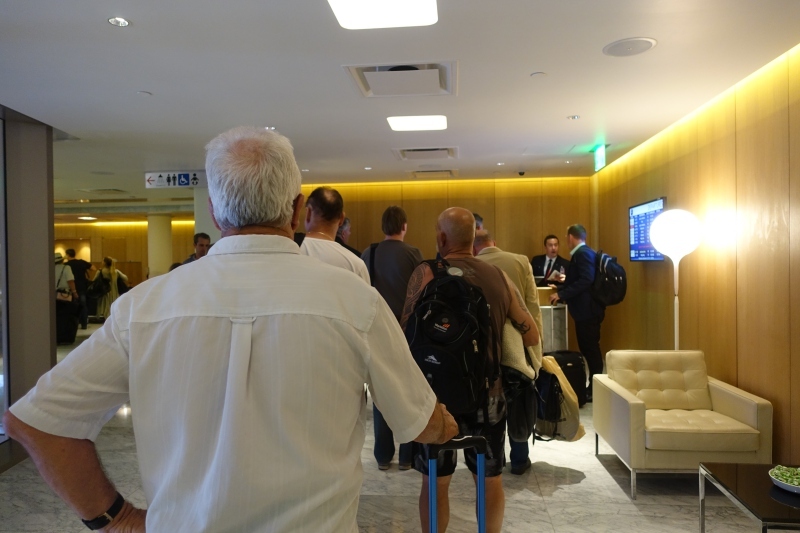 My husband reviewed the Qantas First Class Lounge at LAX earlier this year, but since his visit was in the morning, this review will cover both an evening and a morning visit as I visited the lounge twice on this trip. 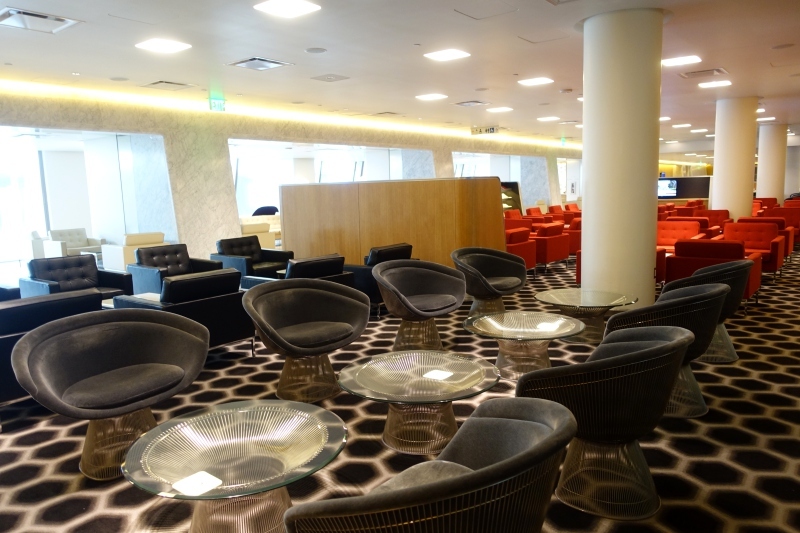 The Qantas First Class Lounge at LAX is located in the Tom Bradley International Terminal (TBIT), level 5, after security. 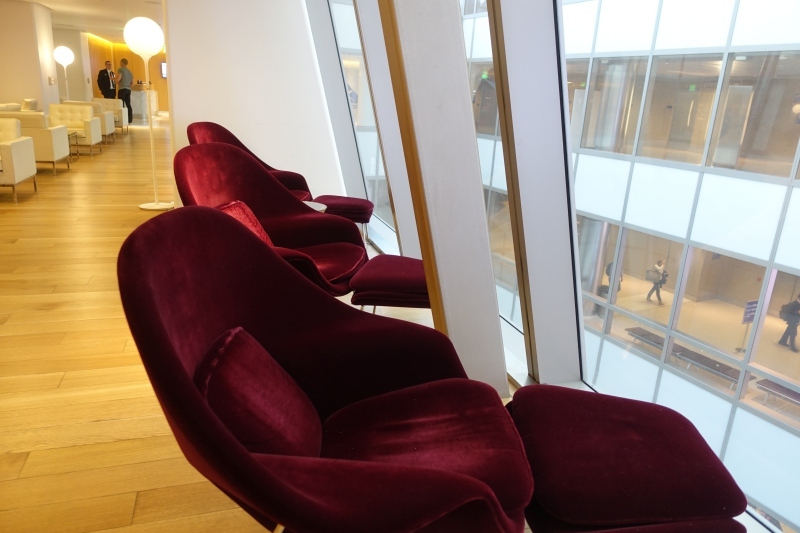 If you're walking from Terminal 4, as I was, you'll round the corner and the lounge will be on your right. I initially walked right past it. The lounge is open daily from 6:30am-11:30pm. 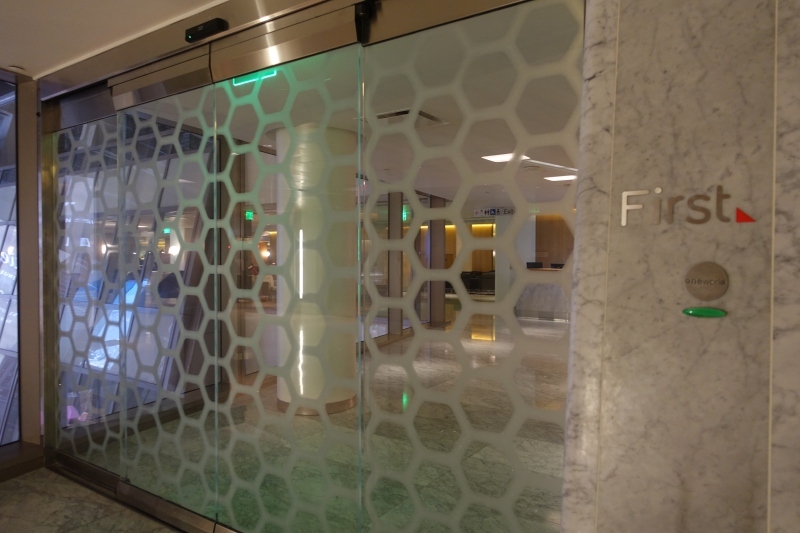 The good news is that you CAN use the lounge if you've arrived on a oneworld First Class flight, even if your next flight is a domestic American Airlines flight. 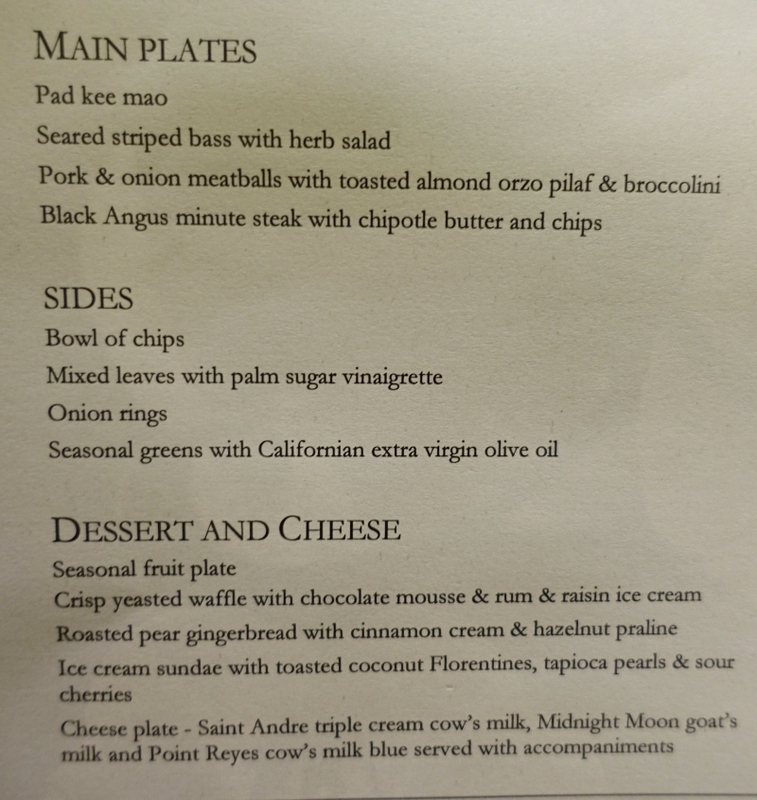 This was my situation on my return, when I arrived on Cathay Pacific First Class, and my next flight was an American Airlines flight to San Francisco. 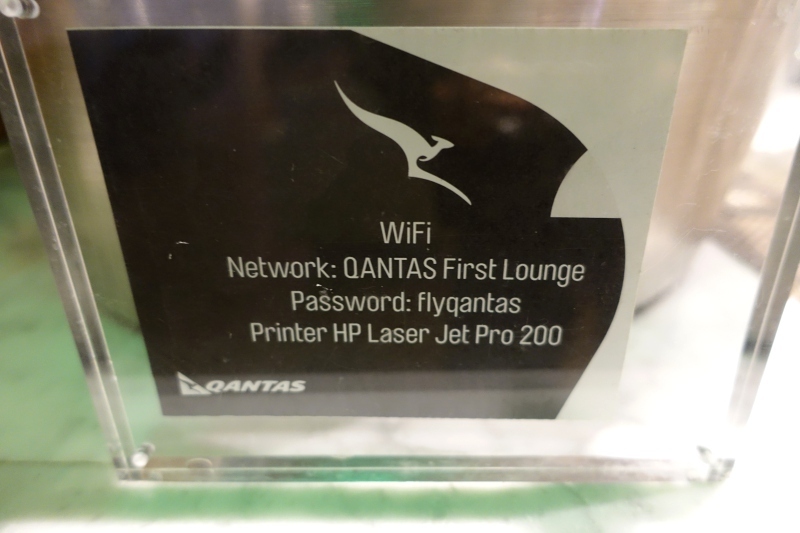 WiFi placards are dotted about the lounge, and at the time of my visit, the password was flyqantas. The WiFi worked well for my purposes of client emails and small file uploads. 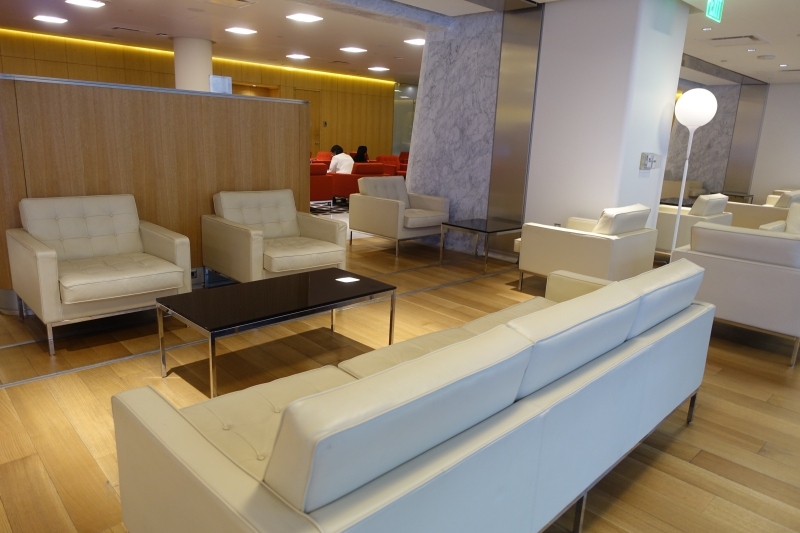 The Qantas First Class Lounge has a number of different seating area and seating types, but is essentially one large room, apart from the individual shower suites. The color scheme is red, white and black, corresponding to Qantas colors. 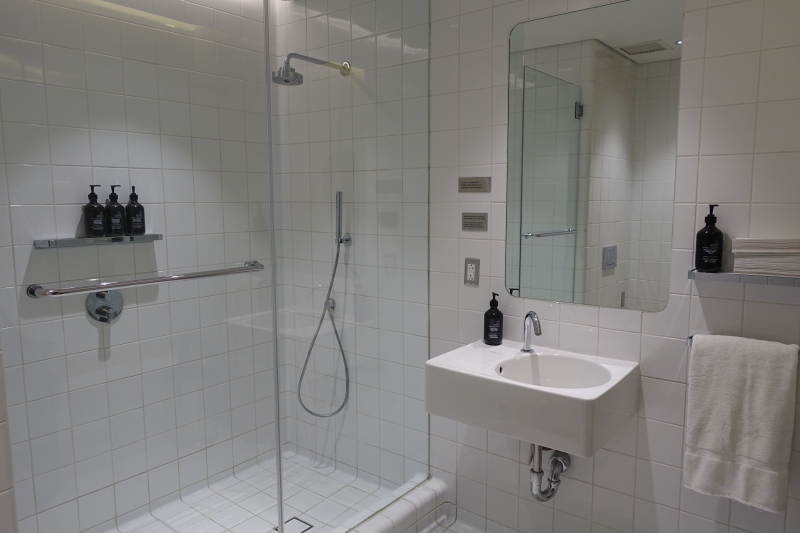 One of the lounge features I most appreciate is a shower room, as apart from a nap, there's nothing like a good shower to help you feel refreshed while traveling. While there are several shower rooms, both times I had to wait for a shower room to become available. During my evening visit, it was about 45 minutes, so I had dinner while waiting. On my morning visit the wait was shorter, about 15-20 minutes, although it took time for a shower attendant to appear as the desk was unmanned. 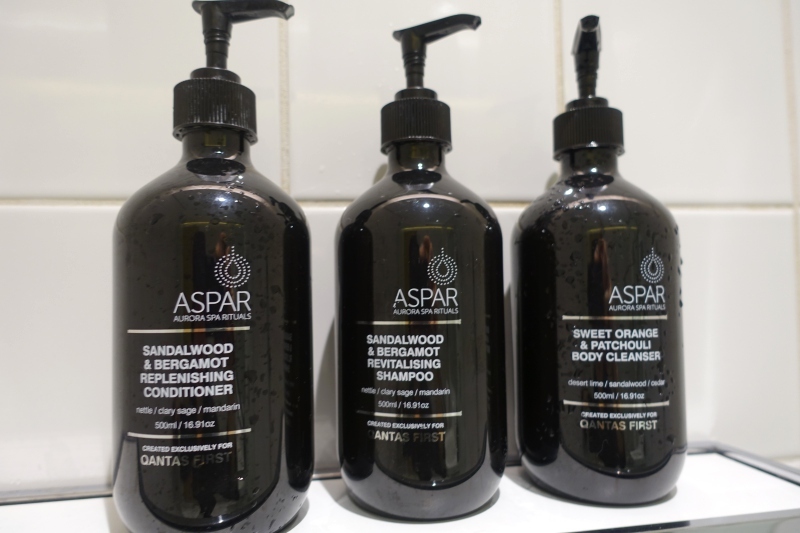 The shower room is simple and spartan, but has most everything you need (don't forget to collect a comb and/or razor if you need one at the desk). 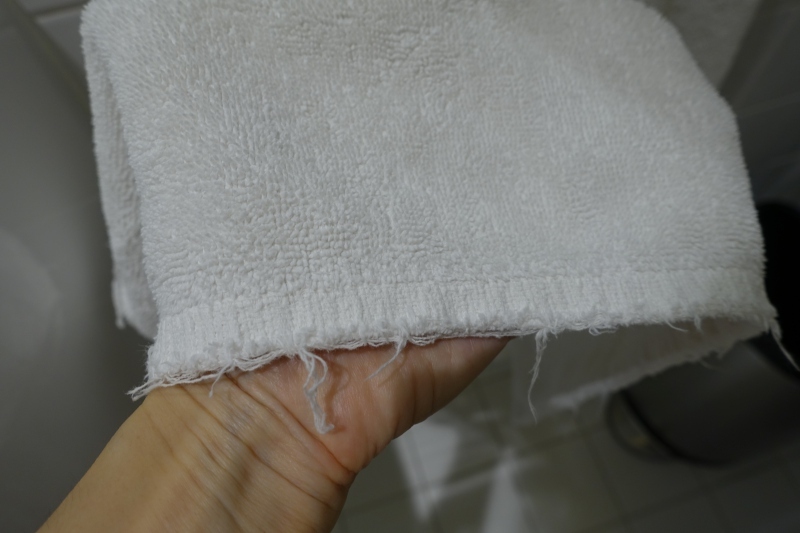 The only thing I didn't care for my first time was the towel, which was fraying at th end and really should have been replaced. On my second visit the towel was newer and in better condition. 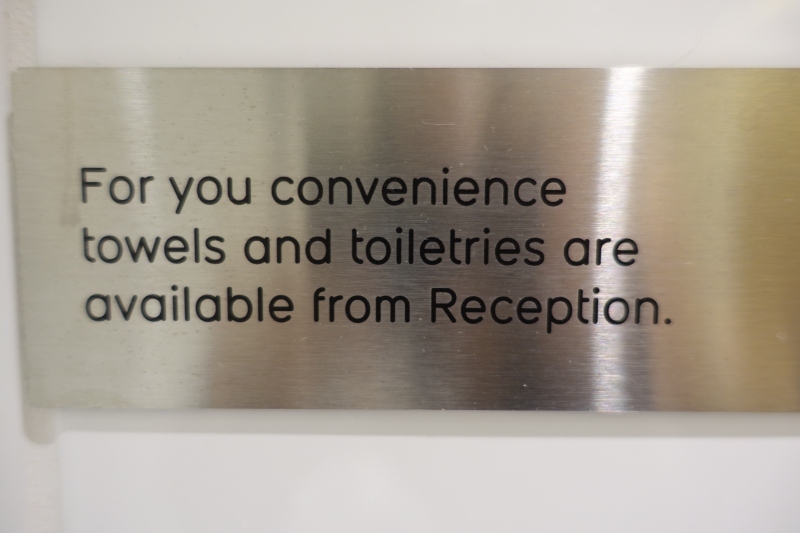 I was also amused by the typo on the sign (“you convenience” instead of “your convenience”). 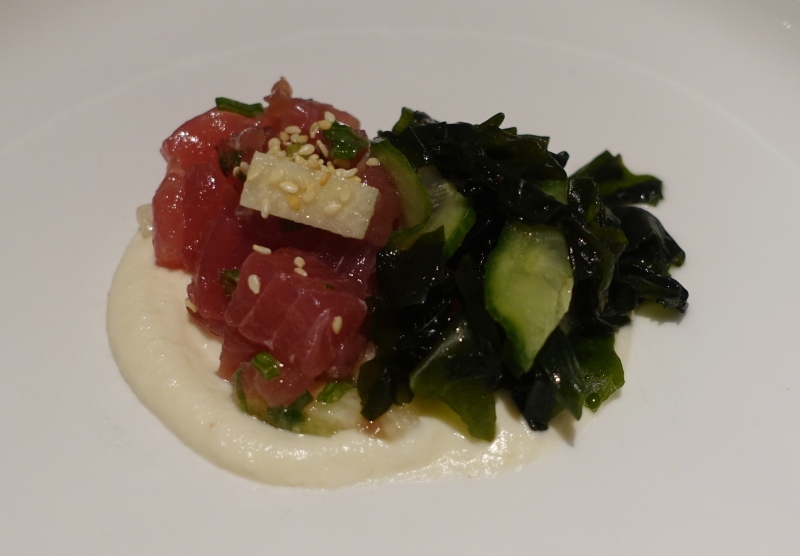 I started off with the Tuna Tartare with Wakame appetizer, and it was fresh and delicious. I liked that the portion was between an amuse bouche and appetizer portion and quite small, which left plenty of room for other dishes. 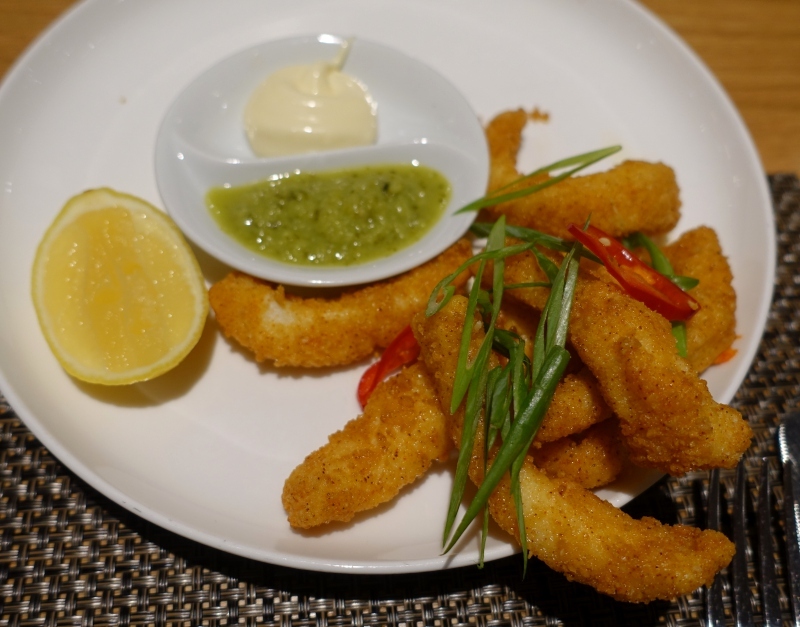 The other small plate I ordered was the Salt & Pepper Squid with Green Chile sauce, and this was perfectly executed: crisp exterior and tender squid (not overcooked, which is a frequent liability with squid) and a no holds barred spicy green chile sauce. 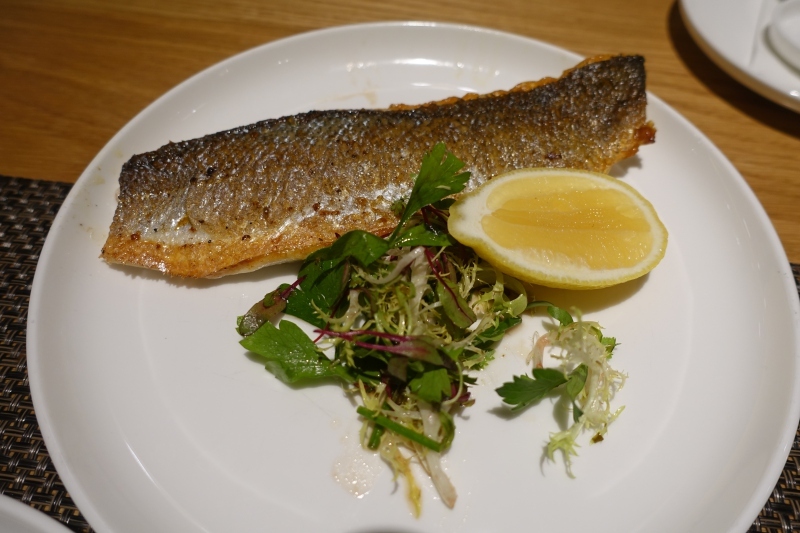 Since I wanted to try a main for purposes of the review but didn't feel up to something too heavy, I tried the Seared Striped Bass, and while this was plainer, it was also very fresh and perfectly cooked. This is a good choice if you're looking for a lighter meal and don't want anything spicy. 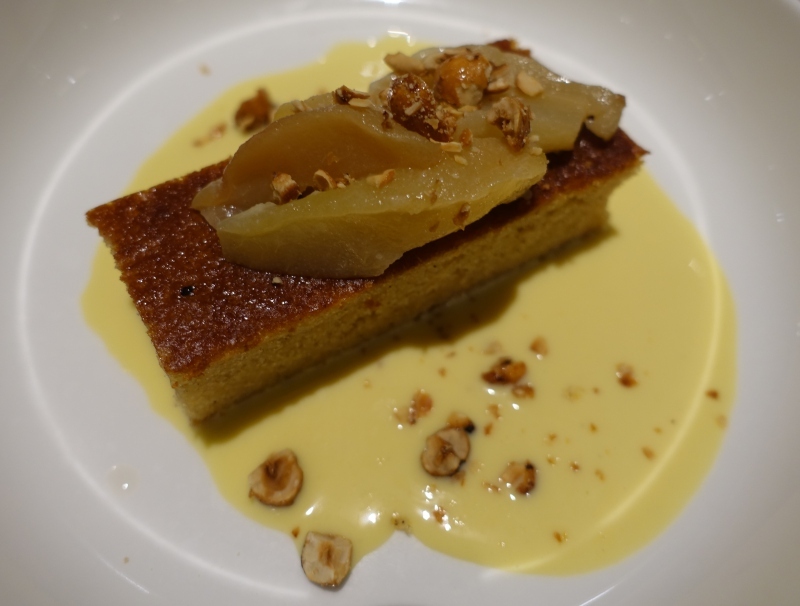 I wrapped up with the Gingerbread dessert with Roasted Pear and Hazelnuts. While I've had better gingerbread, I loved the roasted pear and hazelnut adornments, and the cinnamon cream added a welcome creamy accompaniment. My return visit to the lounge was in the morning, and was much different, with hardly any other guests in the lounge. I was the only one at breakfast at the time. 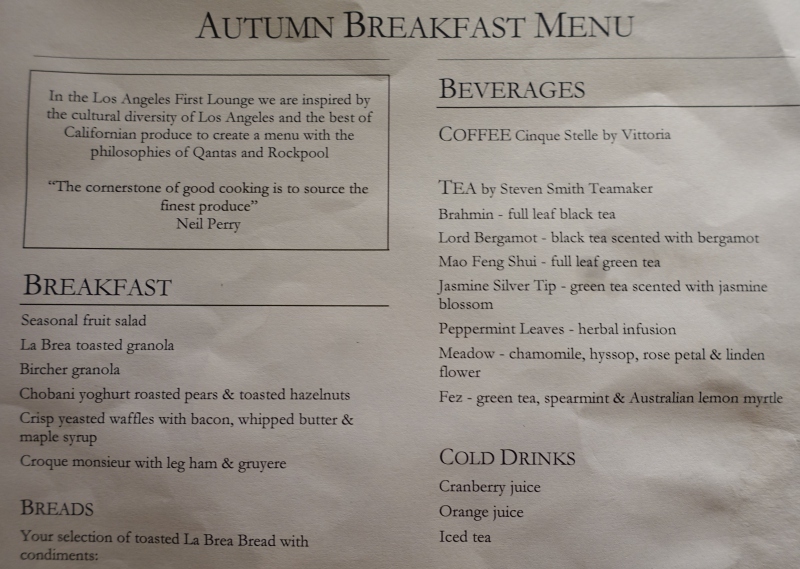 Here's the Autumn Breakfast Menu; there were also a number of egg dishes offered. 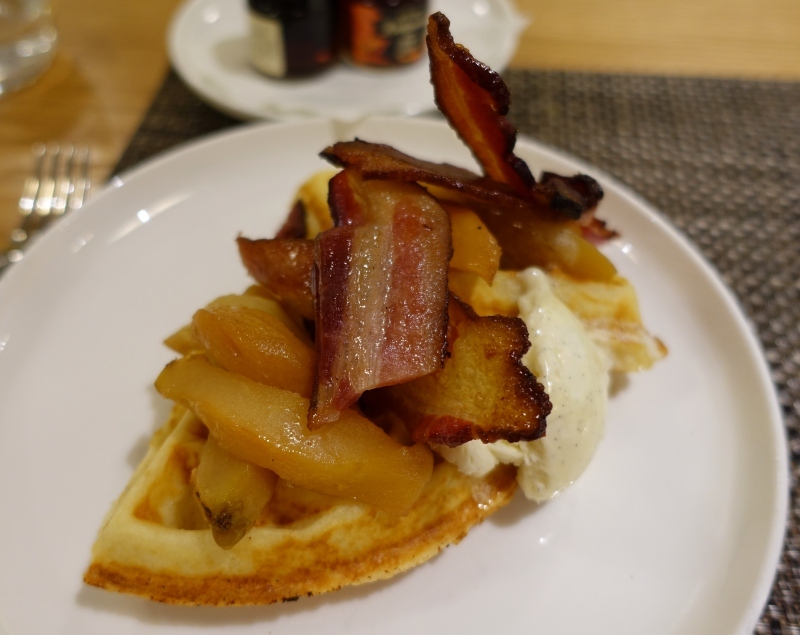 I decided to order the Waffles with Bacon, but asked if it could come with roasted pears (from the yoghurt dish) as well, which the kitchen was willing to do, after the server checked. It may be off menu, but I thought the combination worked extremely well: crisp waffle and salty bacon with slightly spicy and sweet roasted pear. Pure maple syrup was provided in a couple of jars. 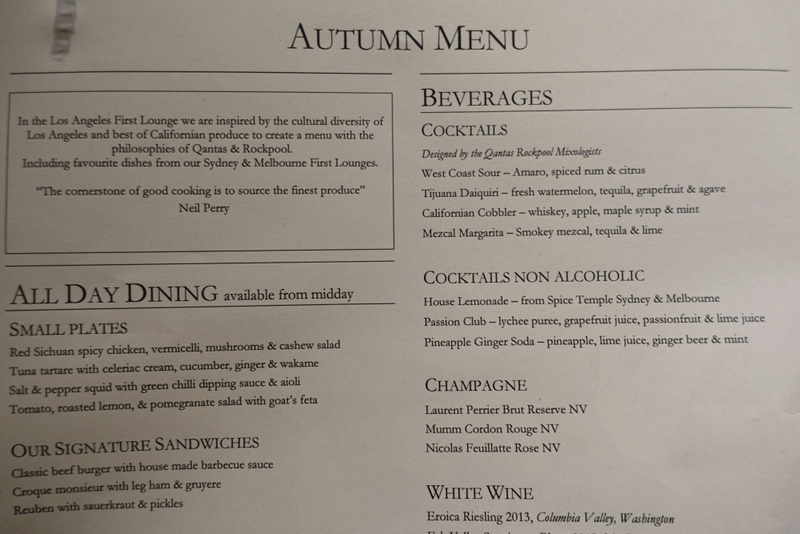 I had a better experience of the Qantas First Class Lounge than my husband did, mostly related to having dinner at the lounge on my first visit and the better dining room service then, depsite how busy the lounge was. While I certainly enjoyed my waffle with pears and bacon, it didn't showcase the kitchen's talents the way the Tuna Tartare and Salt & Pepper Squid did for my dinner visit. It was a far more relaxed lounge experience during my morning visit, since there were very few other guests, so that is a great time to come if you're actually hoping to nap or relax, or have a shorter wait for a shower. While I'd love to see a complimentary spa massage experience or completely flat day beds offered, this is one of the better international lounges in the U.S., especially from a dining standpoint. 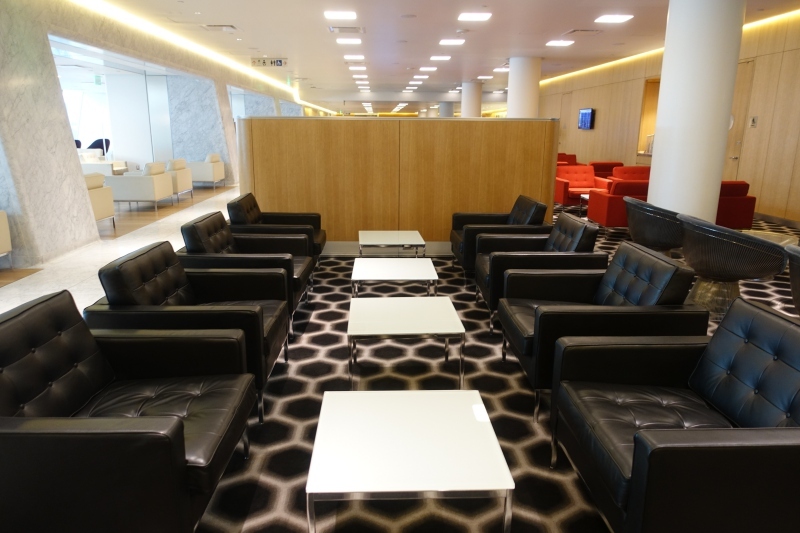 And while the lounge can be accessed by oneworld First Class passengers and oneworld Emerald elites, it maintains a distinctly Qantas feel, not only through its color scheme but also the Australian accents of several of the staff. 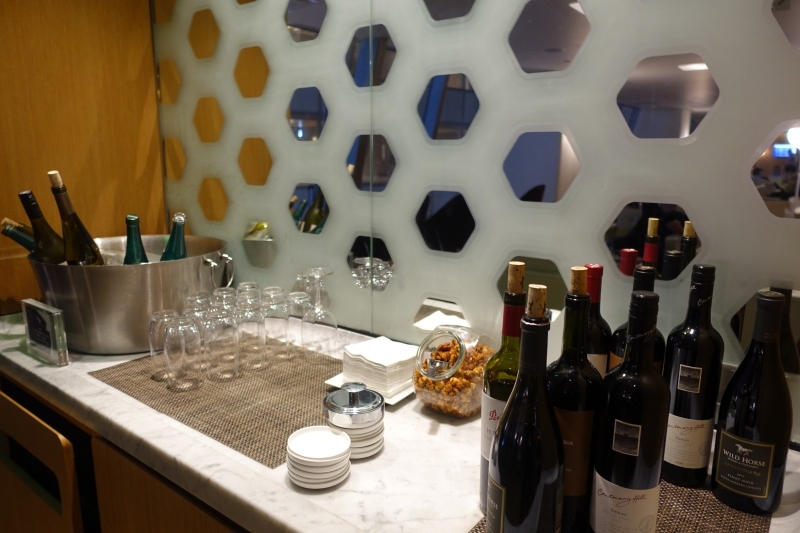 If you've recently visited the Qantas First Class Lounge at LAX, what was your experience?